Simple. Secure. Scalable. Self-Serve BI. Experience incredible BI with Intellicus. Available on premise, cloud and hybrid models, Intellicus is a complete BI suite to meet all the needs of a modern day enterprise. Intellicus’ intuitive report builder enables user interactivity, and provides a thrilling end user experience. Our intuitive and drag-and-drop UI enables you to customize reports the way you want. Intellicus allows you to choose from over 100 chart types to help you uncover new patterns and insights from your data. Intellicus gives you the power to analyze your real-time data, from multiple sources, without any lag, and to monitor your operations as they occur. 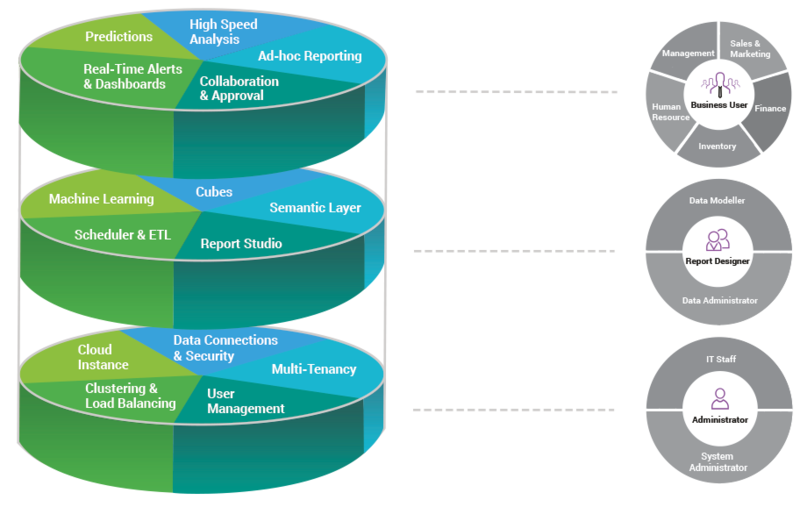 Intellicus eliminates database complexities for end-users. Our rich platform allows users to visually process, blend, and transform data from multiple sources. Business trips or client meetings, you can access your business insights whenever you need! Intellicus mobile BI takes your reports and analytics to tablets and phones, on both Android and iOS platforms, and gives you immediate access to business insights whenever you need them.There is no separate data preparation needed for mobile and our app stays synced with the web version. Business trips or client meetings, you can now carry business insights right in your pocket. Ease of use, no additional preparation for data or reports. Instant access to reports, even without internet connectivity. Multi-dimensional analytics on data in few clicks. Huge variety of charts, graphics and visualizations. Intellicus is packed with distinctive features for all types of users. From administration, to business users, everyone can use Intellicus as per their roles and responsibilities. Intellicus business users can view and explore the reports and dashboards. They can drill down, slice & dice and filter the dashboards to view the different insights. Business users can edit, schedule and also share the reports with other stakeholders. Business users only require a web browser access, no plugins or downloads. Intellicus report designers are data administrators who can model the data to make it analytics ready. Report designers create reports and dashboards for the end users to consume. They manage ETL and can create query objects, parameter objects and widgets to generate reports as needed. Intellicus administrators can access and control the management settings. They can create and manage users and user groups, and determine the access that each user can have. Administrators also manage data connections and the system configurations. They control load balancing and clustering and also manage backup and archives. Gain Actionable Insights with Intellicus.